These creative drinks from Portland servers will make you feel better as the leaves turn. Remember how excited we all were when Cold River Vodka opened its own distillery in Freeport in 2005? At the time, a locally made liquor was almost unheard of. Two years later, Americans were introduced to a fictional ad executive named Don Draper who enjoyed a well-made Old Fashioned. Since then, as the food scene in Portland has grown, so has the cocktail culture. 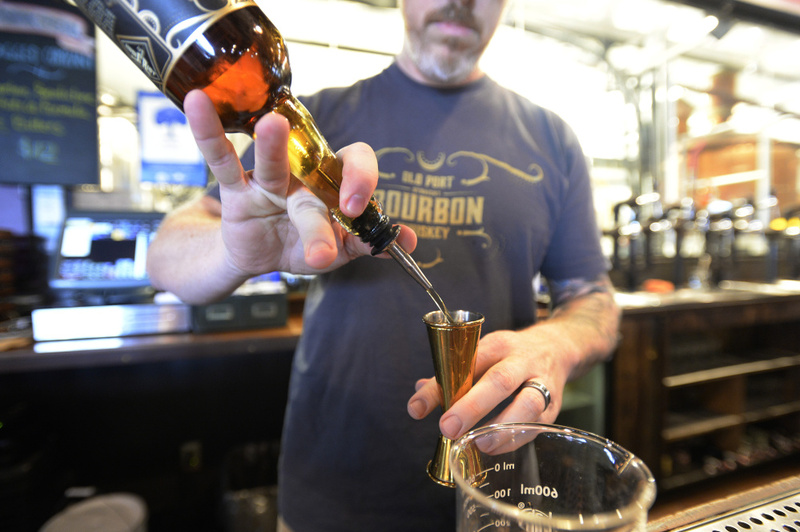 The city now has nearly a half-dozen distilleries making gin, rye, bourbon and other spirits that are giving diners trendy drinks to enjoy in local restaurants and to serve at cocktail parties at home. Along with the distilleries have come interesting and sophisticated cocktail bars and specialty stores selling bitters, shakers, martini glasses and the other accoutrements of cocktail culture. 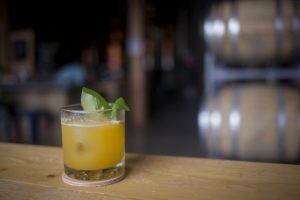 It seemed like a good time to ask Portland bartenders to share their ideas for cocktails that will pair well with the fall season. What would they like to drink after a long day of raking leaves or an afternoon of fun in the pumpkin patch? Many of these recipes are a little challenging, requiring advance preparation so an ingredient can steep or, perhaps, a special trip to the store. But we have concentrated on bottles and other ingredients that are available in local stores, and have offered some substitutes for people who would like a shortcut. With more people making their own shrubs at home, and taking the time to infuse their own liquors with fresh, local ingredients, we trust that the local appetite for cocktails has moved beyond bourbon and Coke, and that our readers are ready to try something different. Just as local chefs have inspired home cooks to challenge themselves in the kitchen, we hope these ideas will bring out your inner bartender. The Tweed Jacket – made with butternut squash, peaches and honey – recalls a slow morning stroll through a farmers market as the season’s best produce reaches its peak. The drink requires that you make several components ahead of time. Once those are made, it comes together in a snap. To make the Peach Puree, peel and slice 3 peaches (about 1 pound of peach slices total). Put the slices into a blender with 2 tablespoons water and a teaspoon of sugar and blend to a smoothie consistency, adding more water or sugar as needed. To make the Butternut Squash Mash, slice the squash in half, remove seeds, and put both halves in boiling water for 20 minutes, or until the squash softens. Scoop the cooked flesh of the squash into a blender, discarding the peel. Add 1 tablespoon water and 1 teaspoon sugar (or to taste) and blend. To make the Honey-Thyme Syrup, put equal parts honey and water into a pan. Bring the mixture to a boil and then reduce to a simmer. When the honey is dissolved, remove from the heat and steep several thyme sprigs in the honey water for 2 hours. To make the Tweed Jacket drink itself, combine all the ingredients. Strain and serve in a rocks glass. Garnish with the basil leaf. 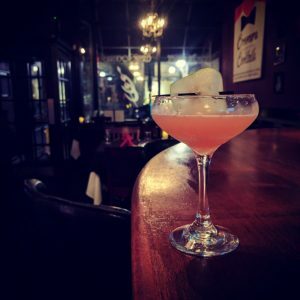 WARREN MURRAY, bar manager at Vena’s Fizz House, has long been a fan of a summery cocktail called “The Last Word.” It’s a strange mix of gin, lime juice, chartreuse green liqueur and maraschino cherry liqueur that was popular during Prohibition and resurfaced a few years ago in Seattle. Murray decided to flip the cocktail forward into fall by substituting bourbon for the gin, lemon for the lime, and allspice liqueur and spiced pear liqueur for the sweeter chartreuse and cherry liqueurs. The result, he says, is “a warming bourbon drink” reminiscent of a mulled cider or hot toddy. The recipe calls for Bitter Armando, small-batch bitters made by Vena’s Fizz House that have a smoky character, but you can substitute any orange bitters, Murray says. And Murray suggests using a locally made version of cranberry bitters from Owl & Whale. Shake all the ingredients with ice and strain into a coupe glass. Garnish with the orange twist. MAX OVERSTROM-COLEMAN, bartender at Little Giant, first traveled to Spain 12 years ago and became enamored of the variety of sherries. He returned recently with the U.S. Bartenders Guild on a trip to learn more about sherry. 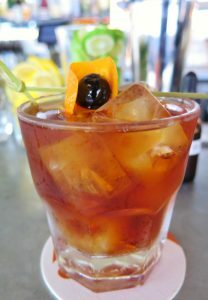 Overstrom-Coleman’s cocktail, called “Midnight in Jerez,” is inspired by the marriage of sherry and vermouth in cocktails such as The Adonis and Bamboo, two drinks that date back to the 19th century. 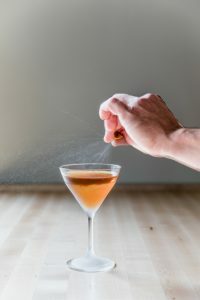 Most people don’t drink sherry or vermouth separately (although bartenders do), Overstrom-Coleman said; combining them makes for a more approachable concoction. And the “deep and dark” flavor profile of Midnight in Jerez makes for a nice celebration of fall. It’s been a recent favorite of restaurant industry folk who come into Little Giant for a drink. The Lustau Los Arcos Amontillado, Dolin Blanc and Carpano Antica Formula (both vermouths) are readily available in local liquor stores, as well as at Little Giant. Overstrom-Coleman suggested sticking with these brands because these two very different vermouths have their own distinctive flavors. The Cesar Florido Moscatel Especial is also readily available, he added, but a Pedro Jimenez can be substituted in a pinch. You can buy the pineapple gomme or make your own. To make the pineapple gomme, combine equal parts by weight peeled and cubed pineapple, sugar and water, and let the mixture sit at room temperature for 24 hours. Strain. Store leftovers in the refrigerator for 1-2 weeks. To make Midnight in Jerez, stir all the ingredients together with ice and strain into a chilled glass. Garnish with grapefruit twist and its expressed oil. 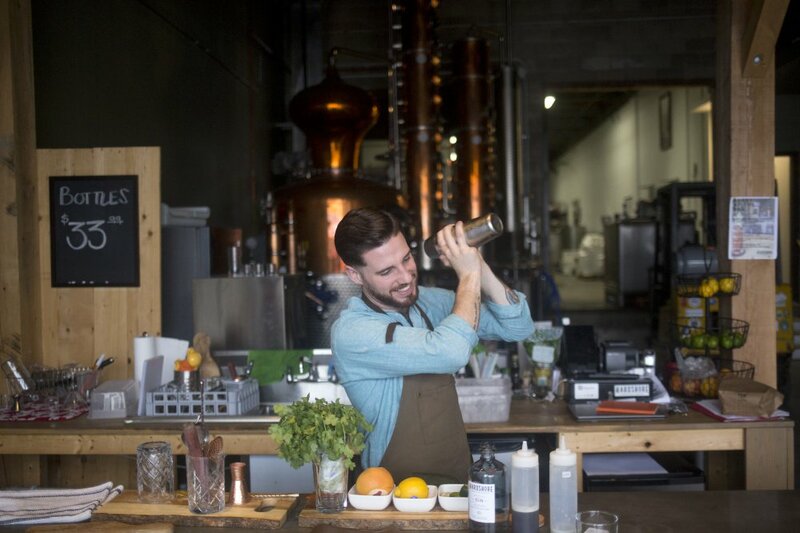 MIKE GATLIN, bartender at Blyth & Burrows, often draws inspiration for his cocktails from the War of 1812 and the cultures and trade routes that were affected by the war. 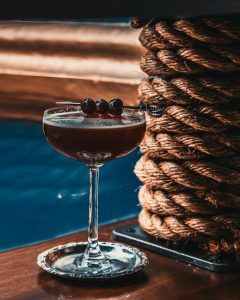 The bar is named after two sea captains who died in battle off the coast of Maine in 1813 (despite its name, the war lasted until 1815), and its cocktail menu reflects the trade routes the two captains would have traveled during their lifetimes. The Sophia Byzantine, which will be on the bar’s fall menu, is inspired by the “Amber Road” trade route, which includes modern-day Turkey. It pays tribute not only to the season – “it’s rich and warm and comforting,” Gatlin says – but to the era and to the Byzantine Empire’s love of coffee and cherries. Cherry juice, he notes, is still a breakfast staple in Istanbul. Shake the first five ingredients together with ice in a cocktail shaker, strain and serve. Garnish with the cherry. This recipe makes enough for many drinks. Mix all the ingredients together in a pot. Heat to boiling – just enough to melt the sugar – then remove from the heat. The syrup will keep for 6 weeks in the refrigerator. 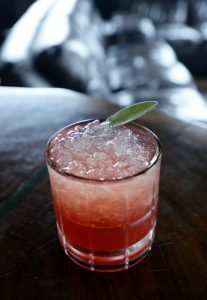 LIQUID RIOT’S “Shrub Down” not only screams falling leaves and fires in the wood stove, it would be a perfect pre-dinner cocktail on Thanksgiving Day. Shrubs are vinegar-based drinks that date back to Colonial times but have been widely rediscovered in the last decade. “I like to think that our new cocktail is a modern take on a Colonial classic,” Marrier said. Marrier credits bar manager Kristin Rouse with this recipe. It will be on the Liquid Riot fall menu, and the ingredients will change seasonally. Combine the whiskey and the shrub in a mixing glass with ice and stir. Strain over crushed ice into a chilled rocks glass. Top with seltzer. Garnish with the sage leaf. Preheat the oven to 350 degrees F. Line a baking sheet with parchment. Bake the cranberries on the prepared sheet for 20 minutes. Let cool. Transfer the cranberries to a 1-quart jar with a tight-fitting lid. Add the sugar, cover and shake vigorously to fully coat the berries. Let the mixture stand in cool, dark place for 5 hours. Add the vinegar to the jar, cover and shake. Add the sage leaves, cover, and let rest in a cool, dark place for 24 hours, shaking periodically. Strain before drinking. 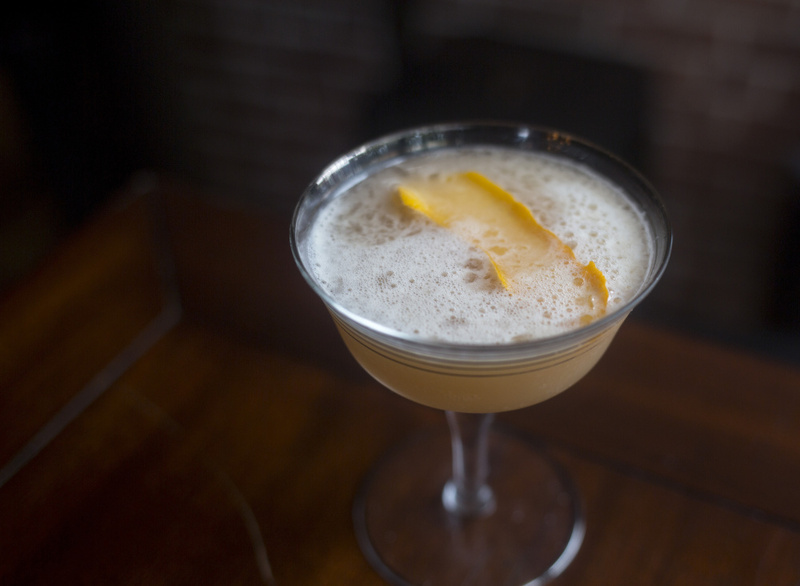 THE SECRET TO Jeff Sherman’s ode to autumn, “Let’s FALL in Love,” is Tom Cat gin. “It’s really potent, which is why there’s only a couple of dashes in it,” Sherman said. If you don’t want to make the orange tincture, you can substitute orange bitters. “It’s a way to add a little bit of citrus flavor without diluting the drink,” Sherman explained. Mix all the ingredients together. Shake hard over ice, then double strain. Serve in a chilled coupe. Combine all the ingredients in a blender. Blend. Strain. Add the peel from 3 oranges to 1 cup grain alcohol and soak for 2 weeks. BIRCH SHAMBAUGH and Fayth Preyer, the owners of Woodford Food & Beverage, named the Oakdale Special after Portland’s Oakdale neighborhood. Shambaugh and Preyer like George Dickel Rye or Rittenhouse Bonded Rye for this drink, but they say Old Overholt can work well, too. Half fill a cocktail shaker or pint glass with ice for mixing. Place a few cubes of ice in Old Fashioned or rocks glass. The larger the cube, the better. Shake 3 or 4 strong dashes of bitters over the cubes in the glass. Combine the spirits in the shaker or pint glass. Stir until chilled and strain over the ice and bitters in the Old Fashioned glass. Serve with a stirring rod and garnish with the orange and cherry.